David Beckham and UNICEF are today launching a groundbreaking initiative, 7: The David Beckham UNICEF Fund, to protect millions of children around the world from danger. 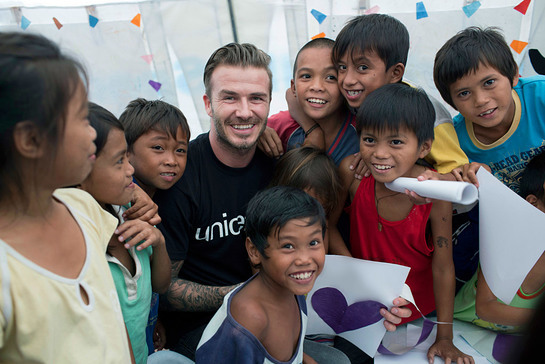 Marking Beckham’s 10th year as a UNICEF Goodwill Ambassador, ‘7’ is David’s personal commitment over the next decade to helping the world’s most vulnerable children. Through ‘7’, David will use his powerful global voice, influence and connections to raise vital funds and encourage world leaders to create lasting positive change for children. David Beckham, UNICEF Goodwill Ambassador, said: "I’ve been a Goodwill Ambassador for 10 years now and I feel so honoured to be part of UNICEF’s amazing work for children. “Today, the need to help children has never been greater and since retiring I have more time and I want to do so much more. That’s why I am setting up this new fund with UNICEF. 7 represents my ongoing commitment to helping children who need it most around the world. This is me stepping up my support – because I can, because I want to, because the outcome will help change the lives of millions of children. Everything I have done, my football career, my family, has led to this point – this is the moment for me to do what I can to help children in every corner of the world. This is something I want my own children to be proud of. The launch of ‘7’, named in honour of Beckham’s lucky number on his famous England and Manchester United F.C. shirts, comes after one of the most devastating years for children on record. More than 15 million children were exposed to extreme violence in major conflicts in 2014, while millions more were hit by natural disasters and thousands were left orphaned and out of school as a result of the devastating Ebola epidemic. Beyond emergencies, children were also at serious risk – with 168 million children across the globe engaged in child labour and many others victims of sexual violence, trafficking and female genital mutilation. ‘7’ aims to harness the hope and potential of 2015 – a year in which international leaders will agree new global goals that will change children’s lives for years to come. Through 7, David Beckham will raise vital funds and advocate for change to ensure that UNICEF and its partners can deliver results for children – whether in education, water and sanitation, health care or social protection – and reach the children who need it most. UNICEF has identified key places, across seven regions of the world, where urgent funding is required to help save and change children’s lives in the next three years. Some are programmes in towns and villages, some are nationwide programmes across a whole country and some across a whole region. All are places where children are living in danger right now – from violence, abuse or disease – places where, to date, the lack of funding has meant children remain vulnerable. Provide child protection services and counselling support to children in El Salvador, the country with the highest homicide rate among children in the world. Provide water pumps and train communities to maintain them in Burkina Faso, where currently 1 in 5 child deaths are caused by diarrhea. Support breastfeeding mothers to give children the best start in life in Papua New Guinea, where child malnutrition has caused stunted growth in nearly half of all children under the age of five. Today when launching ‘7’, Beckham also asked the public and his fans to join him in taking action for children. He asked the public to back his call to world leaders to put children first and help end violence, preventable death and poverty for every child as they negotiate a fresh roadmap for global development – by adding their name to his international campaign. In 2015 the world will agree new global goals that could change children’s lives for years to come. Join David Beckham and UNICEF in calling on global leaders to #putchildrenfirst. Add your voice now at 7.org.